Let’s go for swimming to Shirahama beach! 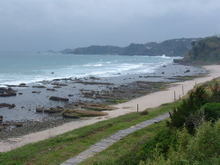 This year we had a lot of days which was cloudy and rainny in Shimoda. But when I waked up this morning it was very beaufitul day today! Blue sky and blue sea, they made me very happy! When I was taking pictures there I found someone on the beach….. This entry was posted in beach on 2008年6月13日 by izusakuraya. 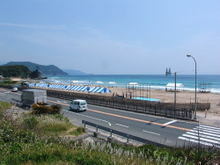 "The 21st Japan National Lifesaving Individual Championships" will take place in Shirahama for 2 days after tomorrow. So many lifesavers are staying at Sakuraya. As it would be sunny tomorrow they will be able to have a good competion. This entry was posted in beach on 2008年6月6日 by izusakuraya. The rainny season started in Tokai area today. The weather forcast said, Tokai area (Shizuoka, Aichi, Nagano …. ) had gotten into the rainny season on June 2nd. The average of starting the rainny season would be the middle of June, but it is earlier than lsat year. I took this picture at Shirahama Chuo Beach, next to Shirahama Ohama Beach. There are a lot of stones and many kinds of sea animals. 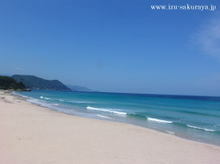 This entry was posted in beach on 2008年6月2日 by izusakuraya.